Posted in browsers, Internet Explorer, Mozilla Firefox | Comments Off on Some More AJAX, Anyone? The industry standard is to facelift a model line once, to up it’s market appeal a little while you ready a completetly new replacement for the model in question. For some (to me) unknown reason, Saab haven’t got the all-new 95 ready in time, so they’re now having to extend the current 95 far beyond it’s intended (?) lifetime. The next 95 isn’t expected to be introduced until 2009, by which time the current 95 will be 12 years old! That’s four or five years older than most car models get before they are replaced. Whether all of this is due to bad management on GM’s part or bad planning on Saabs part (unlikely), the whole thing will most likely have a very negative effect on the Saab brand. Update: Found some more (blurry) photos here. Update: Just found an article (in Swedish) which confirms my suspiciouns that the 92X and the 97X will have a hard time charming the present Saab owners (or even car buyers in general). Saab has already had to lower the price of the 92X and the 97X hasn’t exactly got off to a flying start either. 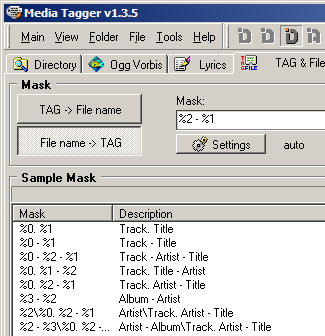 Just found Media Tagger, an excellent (& powerful!) tool for renaming digital audio files. Perfect for getting your music collection into shape. It can batch rename files from meta data tags (ID3/Vorbis), as well as creating meta data tags from the file names. Full support MP3, VQF, WMA, OGG, APE, MPC, AAC and FLAC files. Additional (lossless) formats Speex, WavPack, OptimFrog, Lossless Audio, LPAC and TTA. 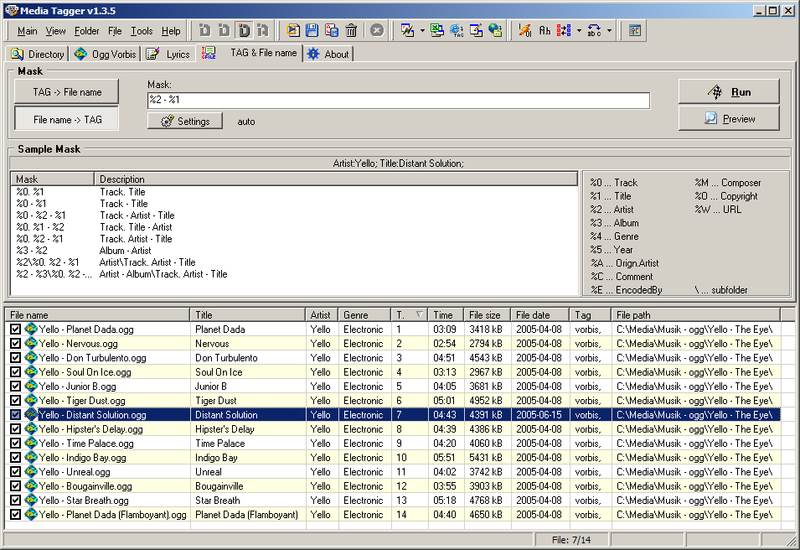 Tags support ID3v1, ID3v2 Lyrics & Pictures, Lyrics3 v2.0, APE version 1&2, Vorbis comments. Easy multi-file tags editing and renaming. Creating Winamp compatibile PLS, M3U and B4S playlists. Downloading TAGs from FreeDB and LocalDB database (www.freedb.org). Export file list and tags to the (.txt, .nfo, .diz) text files, CSV text files and HTML pages with using Template files. Internal file player (mp3 and wma only). Play your multimedia files in Winamp while editing Tags. 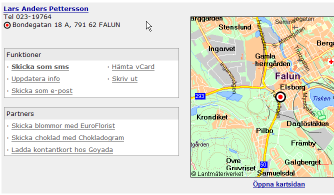 Swaping TAG fields and char case formating. Checking file length for 64 chars (on CD). Store settings and other data in .ini file. Drag & Drop support for opening files and pictures. Integrate in system context menu. Formating filename form TAG, and importing to TAG. It’s great to see Ogg being picked up in different parts of the digital audio industry. Now if only more DAPs would support Ogg, properly. I have yet to see a reasonably priced 512 MB or 1 GB player with full, real Ogg support. A while back I bought a power consumption meter, which I can use to measure the power consumption of any electric device. This was a real eye-opener for me. I knew things used a bit of power while in stand-by mode, but I had no idea how much they actually used! My computer + screen turned out to use a good 20W together, even when I had switched them off with (what I thought was) the hard power switch on the back. In soft power-off it uses 30W. Also, I found out that my speakers use 4W whether off or on, because of the power adapter. Mum’s computer, which is a PIII 533MHz, uses a whopping 65W in normal ( soft ) power-off mode! So, when you’re switching your computer off – pull the plug at the same time. That way we can take some stress off the earth. Posted in Uncategorized | Comments Off on Unplug That Computer! The support for dragging and dropping tabs in Firefox has just been checked in for version 1.1. This is something I’ve looked forward to be able to do, right out of the box – i.e. without extensions. On a related note, the new patching system is making its way into the code, too. Ben Goodger (Firefox lead developer), has a blog post with a screenshot of the new update UI. 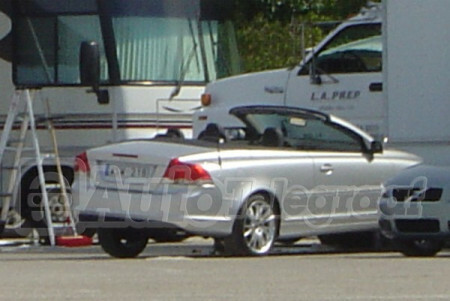 Update: Volvo have now released the official C70 photos. I blogged about that here. There have been a few spy-photos of the upcoming C70, but none have been particularly good. They haven’t really shown what the car looks like. Until now – the Dutch newspaper AutoTelegraaf has published several photos of a completely unmasked car in Miami. I really like the new, lower, rear lights – I’m just wondering where they’ll stick the C70 badge – there isn’t very much room around that number plate. I think they should have made the front a little more agressive though, but it’s hard to tell from these pictures what the head lights really look like in detail. There are lively discussions going on at VVSpy and Swedespeed, if you want to discuss the upcoming car with other Volvonatics. Update: Just saw that someone has posted a picture from AutoBild too. It’s so sharp and real-looking I wonder if it isn’t a leaked press photo… Time will tell. The whole point of these new formats is for them to be open to anyone to work with, so I want to make sure we make it as easy as possible. Posted in Uncategorized | Comments Off on Is This Really Microsoft? It looks like the Opera devs are pretty close to passing the Acid2 test. Just a few more bugfixes and they will be done! Hopefully they will release a version with all the fixes too, in a not too distant future. 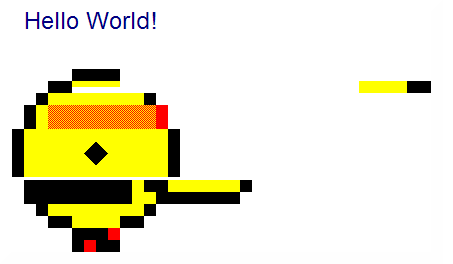 I also sincerely hope the IE Trident developers (Chris Wilson & co) are working towards passing the Acid2 test. If there isn’t time before shipping v7.0, then maybe at least for a version such as 7.1 or 7.5.